This notable home was put on film during the making of the 80’s classic film “Less than Zero,” starring Robert Downey Jr. He would later star in “Iron Man” in which his character Tony Stark lives in a Lautner inspired Malibu home. Sorry, the “Iron Man” home only existed as a stage set piece and visual effect. 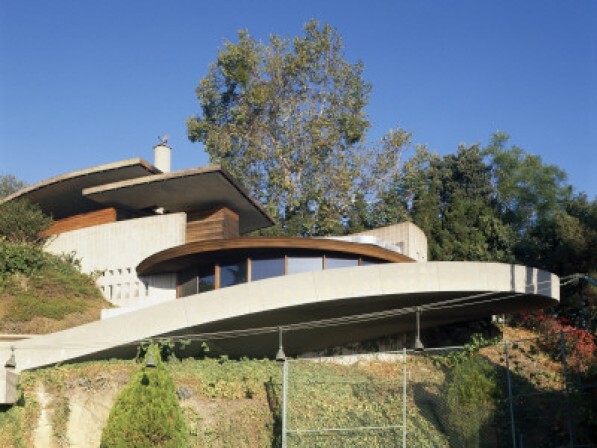 John Lautner designed this 7,500 sq’ 4 bedroom home, and it was built between 1957 to 1963. The house went unoccupied until its second owners purchased it in 1976, Philip & Jacklyn Burchill. The original owner had financial difficulties which kept him from moving in. The home is built into the hillside and designed to take advantage of city-to-ocean views. The living room wall is formed from a curved series of hanging sheets of glass, and the pool appears to pour off the edge of the site into the reservoir below. This entry was posted on Wednesday, November 17th, 2010 at 7:13 pm	and is filed under architecture & design, notable homes. You can follow any responses to this entry through the RSS 2.0 feed.